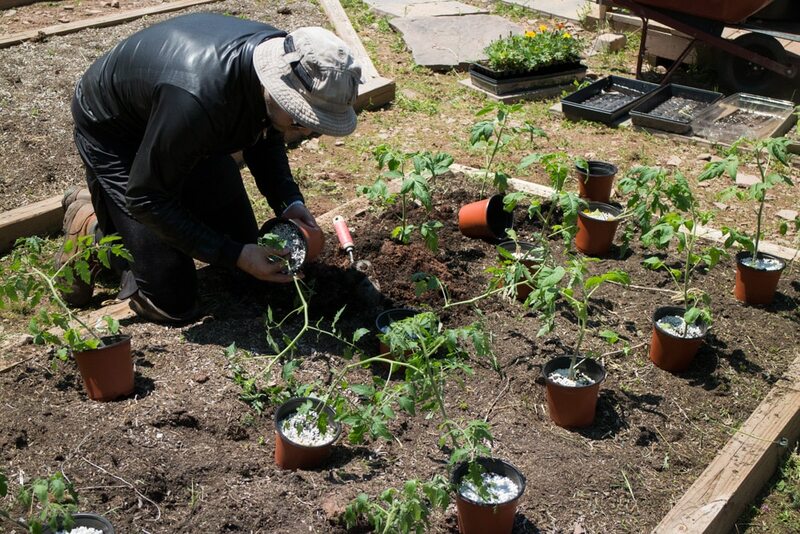 After we get the garden beds ready then we start to plot out where each tomato is going to be planted. This year we said we were going to plant less tomatoes to make the Summer’s workload easier, but of course that didn’t happen. All the seeds germinated and we were left with double plants which we couldn’t kill, so looks like we’re going to have a lot of tomatoes… again! As usual we have our 3 tomato varieties, roma, beef and cherry. We never get very adventurous here, we know what works for us and what we like and we stick with it. Maybe one day we’ll try a heirloom purple tomato, but not this year. 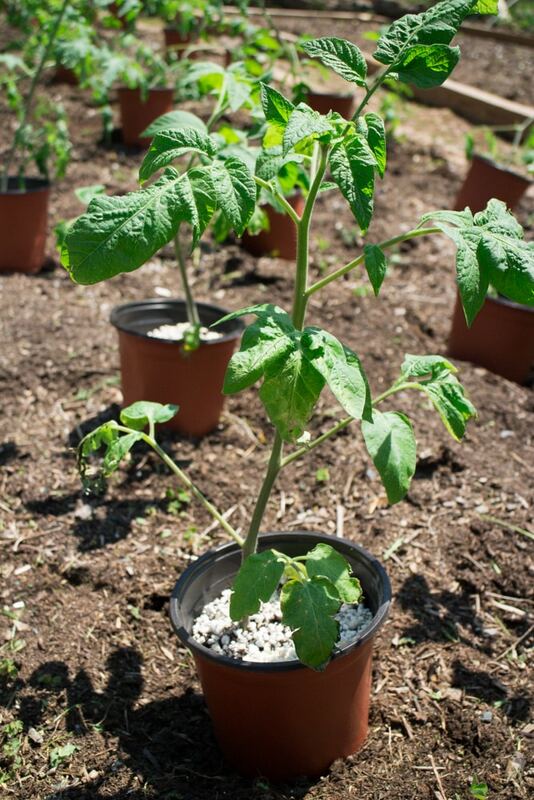 If you notice, each tomato is already in it a pretty big plastic pot before planting. That’s because the tomatoes grow so big in our NYC apartment that eventually we have to transplant them to large pots just to keep growing indoors. I’m not going to lie… I always feel pretty proud of how good they look before even moving outside! Once we map out the tomato boundaries then we start planting each one into the soil. 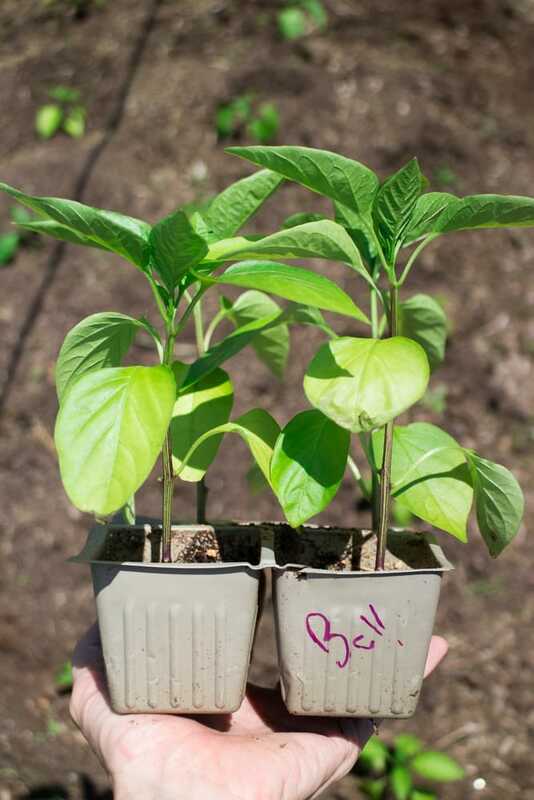 Besides the tomatoes, we always plant the tomatillos too. They have half a bed to themselves. I love myself some salsa verde, but this year I’m going to try a few more tomatillo recipes! It’s also time to plant the peppers (jalapeno and bell). This year I wanted more green bell pepper plants so instead of a couple more I think we planted 20 more. It was another case of the seeds coming up and not being able to chop any of the seedlings down. Oh well, peppers are one of my favorites so if I get a big pepper harvest I’ll be a happy girl. After we finish planting everything then we put cages on. 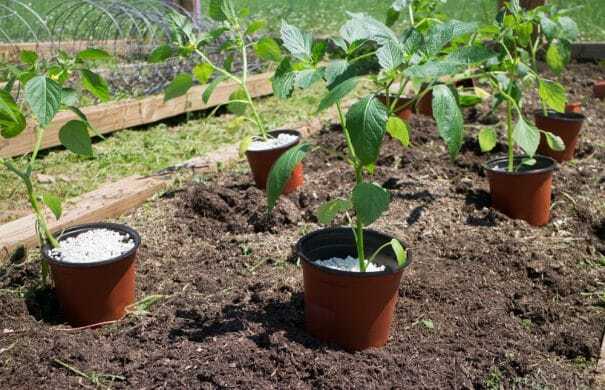 The plants are already big enough that they need support and we always find it’s better to add the cages sooner than later as there’s less room for error with breaking stems. Finally, I’d like to share our marigolds with you, they’re something we started growing ourselves last year. Marigolds are great for gardens because they attract good buggies. 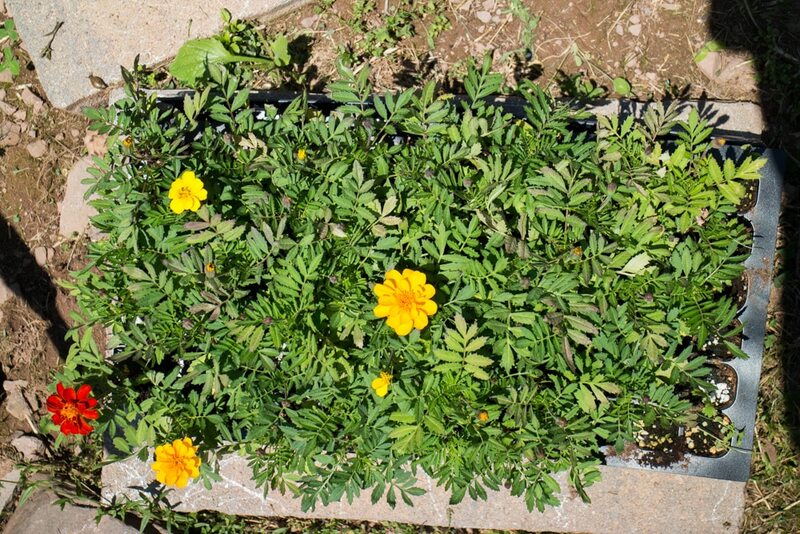 A pack of marigold seeds is cheap and goes a long way, so we started growing our own instead of buying them at the nursery. Each year now we grow a big tray of marigolds and plant them around the garden surrounding the plants to protect from bad buggies. Hope you liked our trip to the garden last week…. 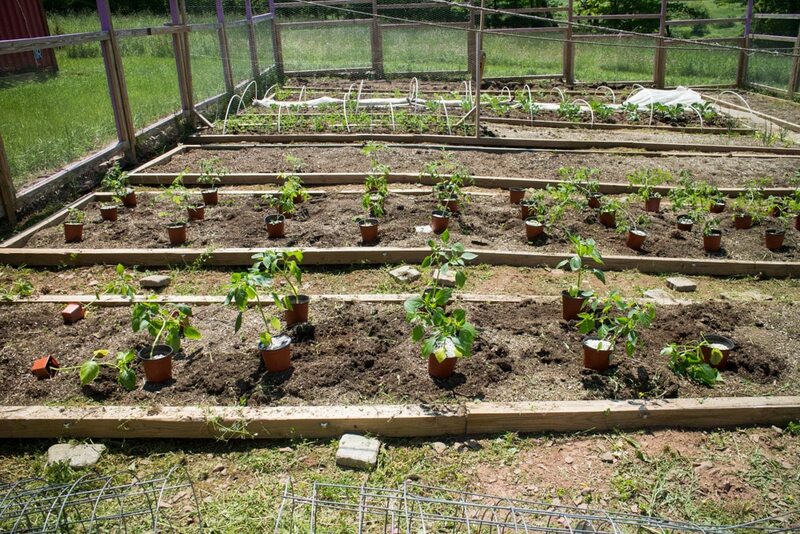 it’s nice to see the tomatoes, tomatillos and peppers moved in! How’s your tomato season going? 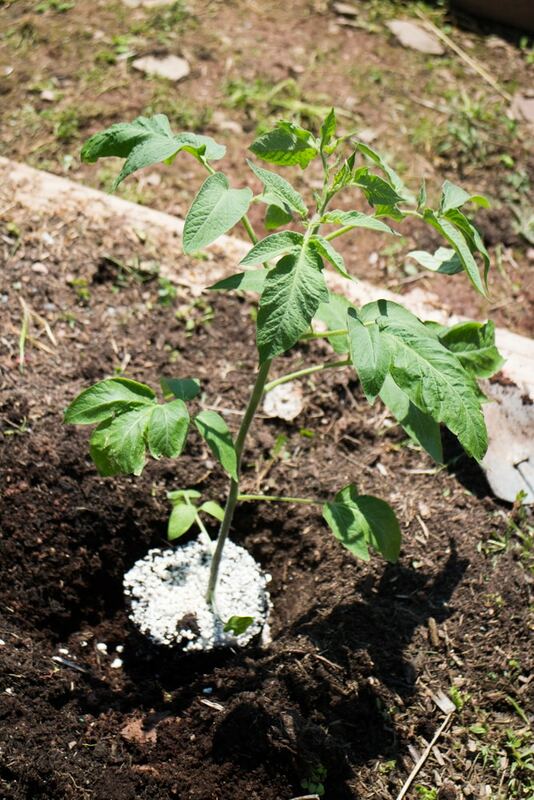 your tomato photos are beautiful and the suggestions are going to put into use in my small garden. Looking forward to more from your site. Thanks, Debbie. 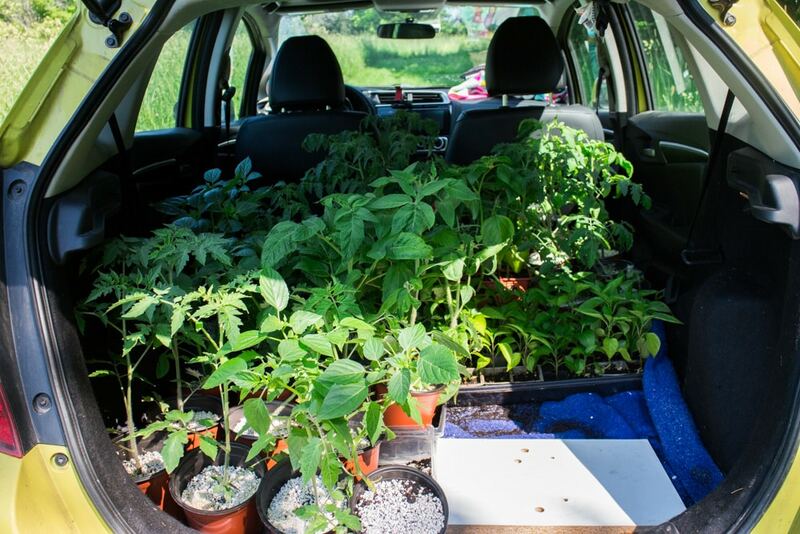 Thanks Debbie, hope they can help you with a great big tomato harvest! Your garden looks amazing! 🙂 I remember growing up we always had tomatoes growing in our garden, lots of them! One of these years I want to do a garden, but I’ll need a refresher! I know where to come to find how! 🙂 You are the master Pamela! Looks beautiful! Your garden is always so awesome! ! 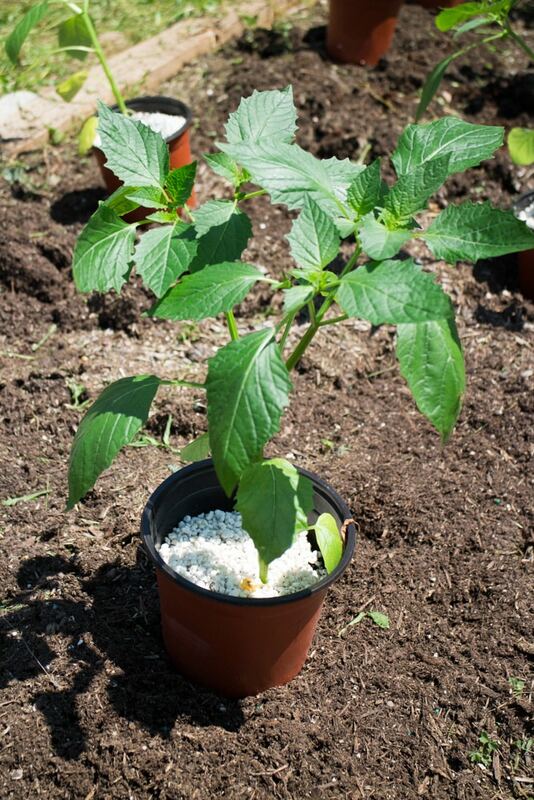 What is the white stuff in your pots? Thanks Sylvia! It’s perlite, we add it on top to keep light off the top of the soil which cuts down on algae growth. Wow, your tomatoes were indoor and they were already SO big! You bet you’re proud! 😉 . We planted sweet million tomatoes in a hanging pot, beefsteak tomatoes, yellow peppers, many herbs, 1 zucchini, all in pots in our backyard along with flowers. They are doing pretty good. 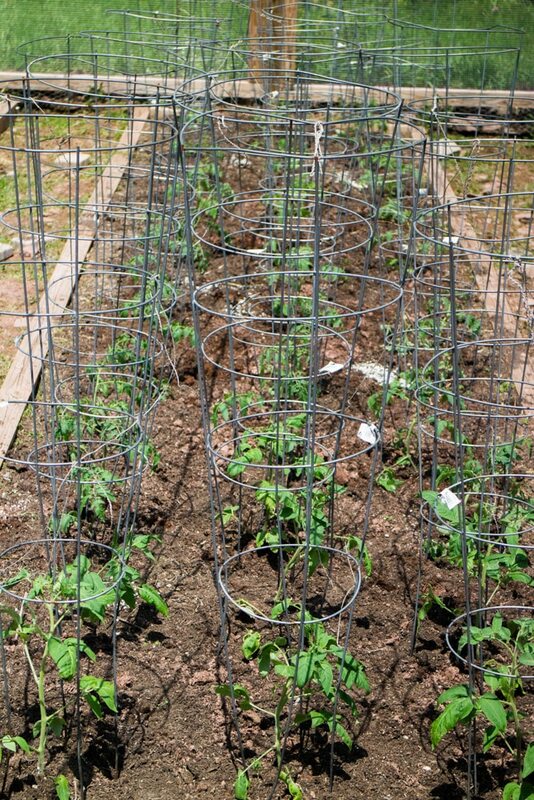 Next year I want to plant tomatillo, you inspired me 🙂 . I’ve never grown tomatillos for some reason. Really should, because I love salsa verde. Fun post and pictures — thanks. What is the white stuff in the tomato buckets on the top? I’m always jealous of all the delicious fresh nom noms you have growing! Wish I lived near you so I could sample everything! 😉 Cheers! OH, I absolutely love your garden, it is winter here so my veggie garden is not doing so well, we also have to be waterwise because it has not rained for a while now. 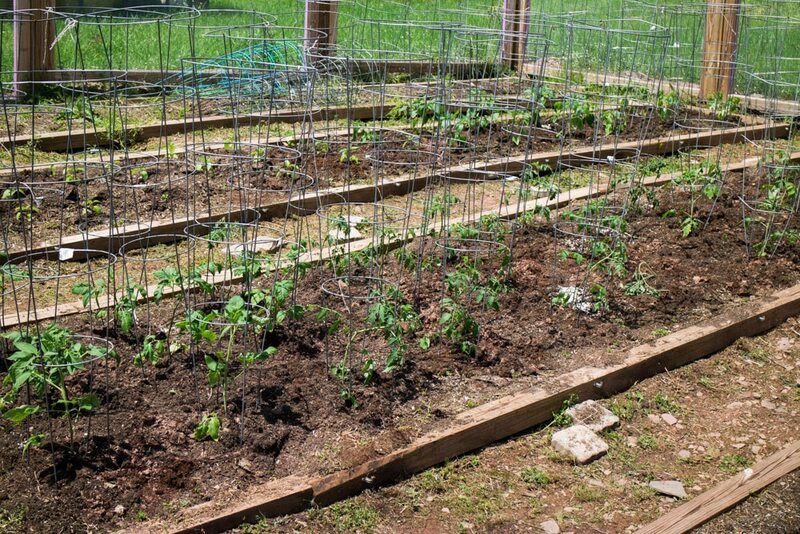 I cannot wait for the Spring showers and beautiful Summer to get my veggie garden growing again. Just working on indoor herbs right now. Have a great week Pamela and take care.? Tomatoes fresh from the garden are one of my favorite things about summer. 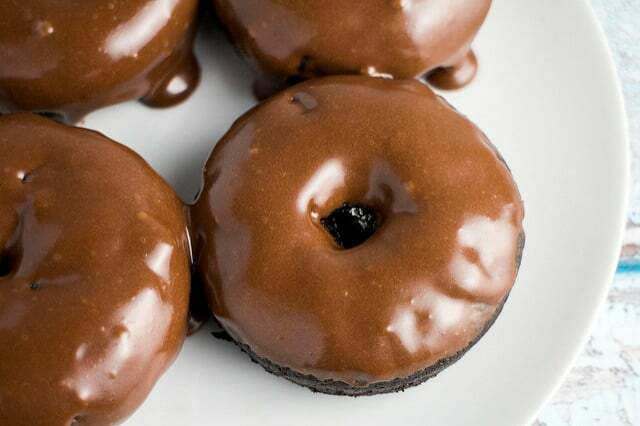 I wish I lived closer so I could take few off your hands! Or I wish you lived in Phoenix so you could teach me how to grow things here :). Love everything you grow 🙂 Fresh summer tomatoes are the best! GUESS WHAT??? My tomato plants are thriving and its winter time. Guess living in the tropics is not just good for me, but good for my garden too.